Lube Mobile are the one-stop solution for small to mid-size fleet maintenance requirements. We are ‘The Mobile Mechanics’ with the capability of a full workshop that comes right to your office or workplace! 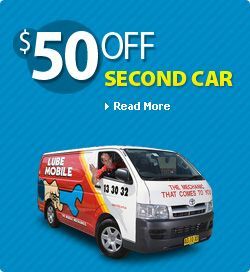 Experience the care, confidence and convenience that are the hallmarks of a Lube Mobile service. We keep your business moving with our tailored fleet management solutions – you will have a dedicated Account Manager as well as the option to have your own dedicated mechanic that takes care of all your vehicles. - Stay in control of costs: We provide a fixed price for all car services as well as an itemised quote prior to any repairs prrior to commencing on your vehicle. We also prioritise the repair quote so you know what is more important and needs doing first. - Centralised billing & accounting: You will receive one simple invoice with 30 day terms (to approved customers). Each invoice is fully itemised providing you a breakdown on what has been done in every job. - Friendly, personalised and professional customer care: Your fleet account will have a dedicated account manager and mechanic so we can deliver a personalised and professional service every time. You will also have a central number to put you in touch with a dedicated team member that knows everything about your fleet account. At Lube Mobile we cover all aspects of fleet maintenance in one seamless, efficient and convenient service. For more information or to set up an account, please contact our fleet manager on 13 30 32 or submit the enquiry form below.